This week, I’m sharing a post for those of you who (like me in previous years) leave shopping to the last minute. Because let’s be real: with the craziness of the holiday season, the task of shopping for your loved ones can feel a bit overwhelming. And taking into consideration everyone’s personal style and taste… seems impossible, especially if you’re from my family. 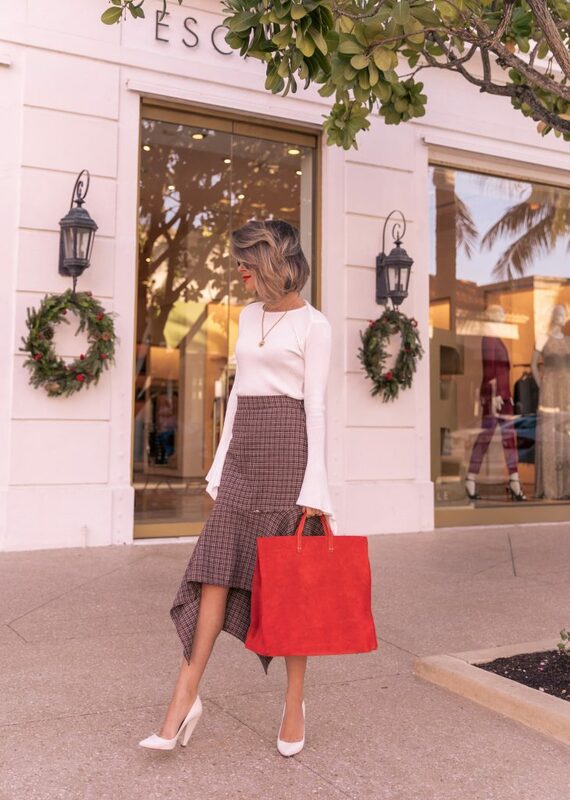 Last month, I was introduced to Clare Viver’s holiday collection at Nordstrom. As soon as I saw it, I knew it would be the perfect topic for those of you who experience the same problem. There was a style for everyone… your mom, sister, aunt, bestie. Literally everyone. Clare V., known for her accessible clutches and totes, went on a trip to Zanzibar, Africa where she was inspired to make this collection. Each piece reflects vibrant colors and prints she discovered on her trip. Super cool, right? Looking at it, you can’t help but admire how fun the collection is. From supple leather to snake prints to the rich suede and gold metal details… it’s great. So on that note, I chose this bold tote for myself because I love how it adds an extra “pop” of color to outfits. #confessionsofashopaholic I paired today’s look with a simple white sweater, a plaid midi skirt and white heels. The addition of my bag made this look feel elevated. I loved this crossbody bag for my mom! And this leopard clutch for my sister. Even blogger Julie Sariñana of Sincerely Jules has been spotted wearing it! So if you have a few more gifts to check off your list this holiday season, and maybe even a little somethin’ somethin’ for yourself, consider this collection from Clare V.
Happy Thursday – check back tomorrow for a new video! Mwa. I recently came about your blog, and I am totally in love with this outfit! It is so elegant and classy!